Series 2a, 2¼ Petrol from engine suffix 'J' onwards. Series 2a, 2¼ Diesel from engine suffix 'H' onwards. Series 3, 2¼ Petrol and Diesel engines. V8 engines, 8.5:1 and 8.25:1 compression ratio engines, only for 120°C Gauge. 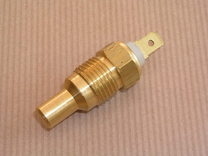 See 623050 for 140°C oil temperature gauge equivalent.